Author: Chris Saller, et al. 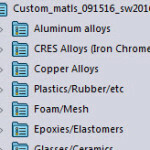 Ctopher’s Custom Materials Database allows you to add many materials to SOLIDWORKS which are not currently included as part of the default installation. Materials range from ceramics, metal alloys, plastics, crystals, and even magnets. Current version was created using SOLIDWORKS 2016. This database is provided for reference only, being based on tertiary sources. The database is not an official offering from DS SolidWorks Corp. in anyway, nor is DS SolidWorks Corp responsible for any content or how it is used. Information within the database is not guaranteed to be correct or accurate. Information within the database was submitted from multiple persons and sources. No one is responsible for the content of the database. The user of this database uses it at their own risk. The user is responsible to crosscheck all information for accuracy to a level that suits their own needs. The database is a combination of materials used in aerospace and military applications, and SolidWorks users around the world submitting material properties to add to the database. The material mass properties have been tested with actual parts on a scale. 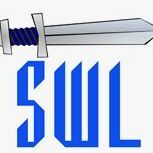 1.To use, place custom_matls_091516_sw2016.sldmat file into C:\ProgramData\SOLIDWORKS\SOLIDWORKS 201x\Custom Materials folder. 2.Start SOLIDWORKS and open any part file. 3.In the Feature Tree, right click on Materials and then select Edit Materials. “Custom_matls_091516” folder will be on your material list. Excellent job. That was a great deal of work. Thanks for sharing. SFV here so 2-3 hours out; but was just saying where do i put in for donations lol. Hi. I have a query when loading the materials, I do not see the visualization for the material corrugated board boxes, why? At the time I did not have any visualizations and did not have a use for them. I’m in the process of updating our servers to 2018. I’m hoping to get time to update the database later this year.